Looking for a cold weather activity? Try to escape from Locked In! Escape games have become increasingly popular in recent months - you may have seen your friends post pictures on Facebook or Instagram, indicating if they were able to "escape" or not. 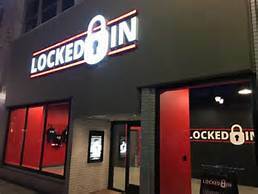 If you're looking for an indoor activity to occupy your time during these cold winter days, plan a night out at Locked In! Fun for a girls, guys, or couples night out, Locked In can accommodate 2-8 people per adventure. There's an adventure for all skill levels - starting from easiest to most challenging: The Warehouse, The Museum, The Laboratory, or The Classroom. Once your adventure is selected, your group will be "locked" in the appropriate room and be asked to figure out clues and puzzles in order to escape within 60 minutes. Winners get bragging rights - but if for some reason you can't escape, you'll surely want to try it again soon! This is also a great place for a corporate event or team building exercise. Locked In is located at 521 S 4th Street. Reservations need to be made in advance, and the cost is $27 per person. While you're downtown, take a look at some of the great properties that are for sale in the 40202 zip code. Louisville has some of the best downtown living, with amazing condos overlooking the Ohio River that are walking distance to all the restaurants, museums, and entertainment that downtown has to offer. One of our agents will be glad to schedule showings for any houses or condos you may want to see before your night out at Locked In.